Orian has teamed with Bransty Primary School to assist in their entry for the Centre for Leadership Performance Bright Stars competition. The excitement is building for the awards presentation on March 16th, when five winners will be announced for each of the following categories: Most Profitable Business, Best Example of Teamwork and Leadership, Best Business Idea Best Effort and School Judges’ Favourite. 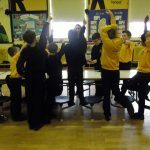 The company has been involved with the pupils from the very beginning; conceptualising their business idea, formulising a scheduled plan and organising a pricing structure for the committee to follow as well as being hands-on in producing the finished product – the yummy Bransty Beez biscuits! The team have put in a tremendous effort and surpassed all expectations. They sold out on the first day of Whitehaven Market on February 22nd (where they will be returning every week until the competition closes) and have been busy creating new tasty flavours to keep their customers returning again and again. 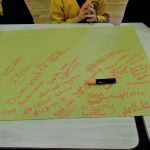 On March 2nd, Clary Hayes – Orian’s Marketing Manager, visited the school to work with the children on what it takes to produce an effective advert. They spent the morning learning about the purpose of adverts to understand how one would provide a great platform for selling more biscuits. The group then polished an excellent script for their own recorded advert and practiced to perfection. All agreed that the ready-made mascot, Buzzby Bee, would provide a recognisable and friendly face of the campaign. The group likened Buzzby to Foxes biscuit’s Panda and the Nesquick rabbit, who help to appeal to the target audience. We’ve included some pictures taken from the session and you can find regular updates on the committee’s success and activities in the final weeks of the competition on our Facebook and Twitter pages. 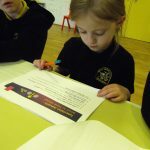 All support for all the children’s hard work is welcomed and by placing an order on the school’s website: www.bransty.cumbria.sch.uk/news/, you’ll be contributing to a fantastic cause!